Can someone please give me a step by step on how to get a vip monthly cars via diamonds already earned and the next lvls of vip using diamonds i already earned? 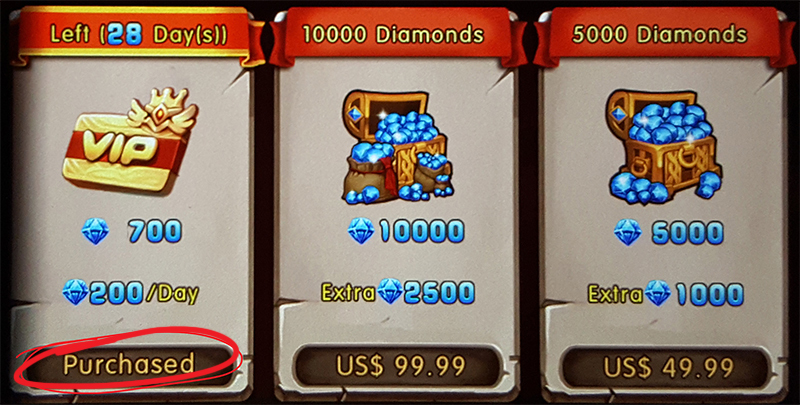 You can NOT buy the monthly VIP card using Diamonds, nor can you upgrade your VIP rank by having x diamonds. VIP ranks ONLY increases based on the amount of money you charged to obtain the diamonds. If you wish to get Rank 3 VIP, you need to make another purchase of that 1500 Diamonds you mentioned with real money. Finally, if it says Purchased under the VIP card like the below screenshot, then you already own it. Purchasing a VIP subscription will give you access to special benefits such as no cool downs, free alchemy, and increased purchase caps. Simply purchase a 1-month VIP card for $6.99 or 699 Diamonds. Purchasing a VIP card will instantly grant you VIP 3 access, as well as 500,000 Gold! 2019-4-22 04:53 GMT+8 , Processed in 0.552604 second(s), 42 queries .